After almost two decades and more ups and downs than the Nasdaq, the Red Hot Chili Peppers had a banner year. 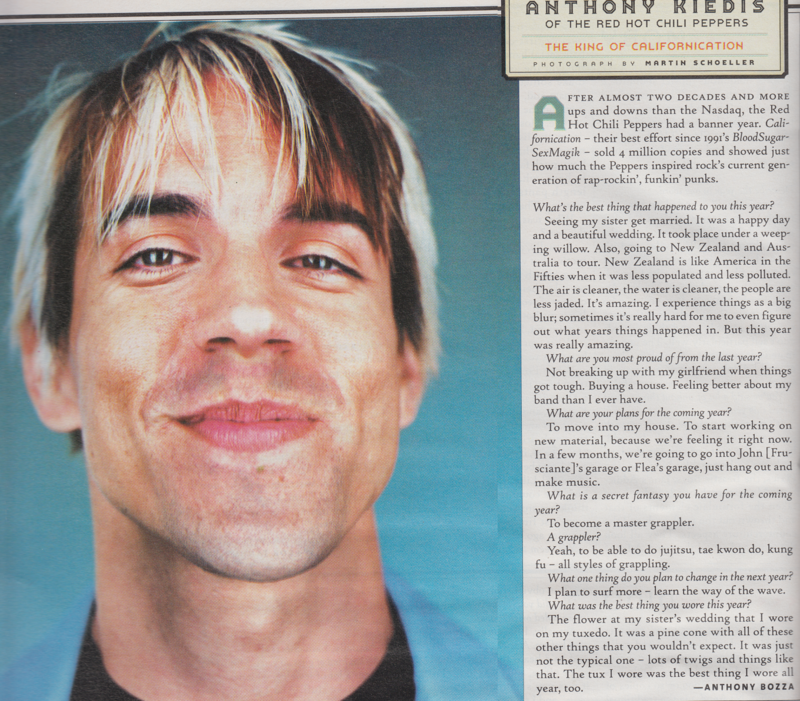 Californication -their best effort since 1991’s BloodSugarSexMagik – sold 4 million copies and showed just how much the Peppers inspired rock’s current generation of rap-rockin’, funkin’ punks. AK: Seeing my sister get married. It was a happy day and a beautiful wedding. It took place under a weeping willow. Also, going to New Zealand and Australia to tour. New Zealand is like America in the Fifties when it was less populated and less polluted. The air is cleaner, the water is cleaner, the people are less jaded. It’s amazing. I experience things as a big blur; sometimes it’s really hard for me to even figure out what years things happened in. But this year was really amazing. What are you most proud of from the last year? AK: Not breaking up with my girlfriend when things got tough. Buying a house. Feeling better about my band than I ever have. AK: To move into my house. To start working on new material, because we’re feeling it right now. In a few months, we’re going to go into John [Frusciante]’s garage or Flea’s garage, just hang out and make music. What is a secret fantasy you have for the coming year? AK: To become a master grappler. AK: Yeah, to be able to do jujitsu, tae kwon do, kung fu – all styles of grappling. What one thing do you plan to change in the next year? 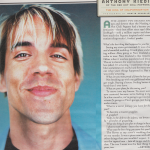 AK: I plan to surf more – learn the way of the wave. What was the best thing you wore this year? AK: The flower at my sister’s wedding that I wore on my tuxedo. It was a pine cone with all of these other things that you wouldn’t expect. It was just not the typical one – lots of twigs and things like that. The tux I wore was the best thing I wore all year, too.